I just saw your post 72 usmc, I will get some pics for you soon. Anything in particular you want to see? After seeing your pics of your "cleaned up" rifles, I am unsure what I have. 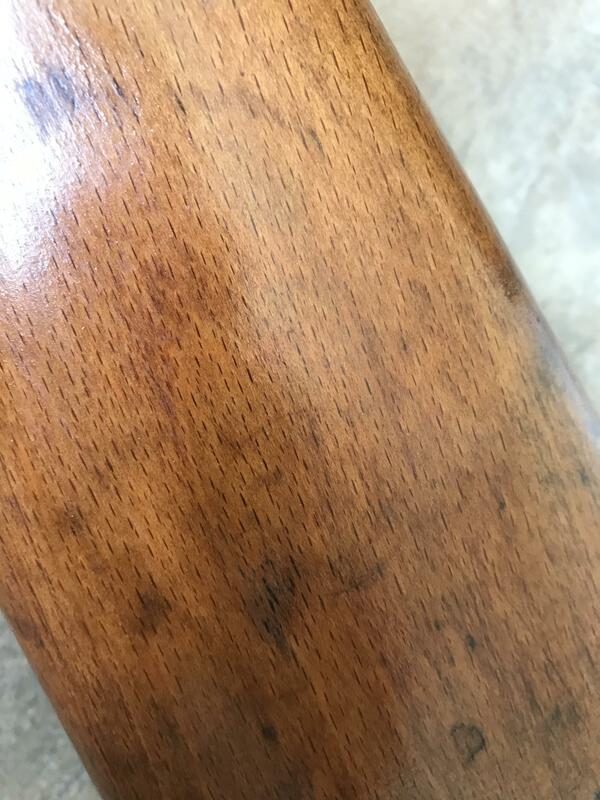 The metal is not pitted at all, the wood has very few dings and grime. It looks like it was issued, but has never been in the field. if possible some of the wood and metal conditions. Sounds like you may have an intact rifle. A very odd rifle, the blue looks incorrect and the stock seems not to be an arsenal refinish. Someone made it pretty in an odd sorts of way. My first guess without actually seeing it in person is it is not a true French arsenal rebuild. Some of the screws are also redone with the blue. I have never seen such an animal. Most of my pictures are of dog Berthiers out of barrels back in the day at Woolworths or hardware stores in the mid 1960s- mixmasters. Hunter's Lodge mail order $12 rifles. Thanks for the pictures-- totally different then I have ever observed. Did you see more in this state of repair? Note the sling bar or ring show absolutely no wear from sling use. Bolt patina does not match receiver/barrel patina. I can see no evidence of subsurface rust, pits, or dirt under that the nice blue-- its so even? Just too nice on an old workhorse? BD 4161 was made in 1926/27, one of the highest known SN. Is there a circular reception stamp on the right side of the stock? Yes let's see a photo of the right side of the stock Is it sanded down ? Kelt any thoughts on the finish? Your guys' guesses are better than mine. This will be my only Berthier to go along with my MAS 36 as a representation of French rifles for WWII. I bought some ammo for it from Gunbroker and will hopefully fire some rounds from it in the near future. In person it does not look like blue at all. When I read that article about them using locomotive paint on some rifles made sense to me, that's what it looks like. It is definitely think and even slightly gloppy in some areas. I am well aware of the Mitchell's Mausers and steered clear of them when looking for a K98 years ago. 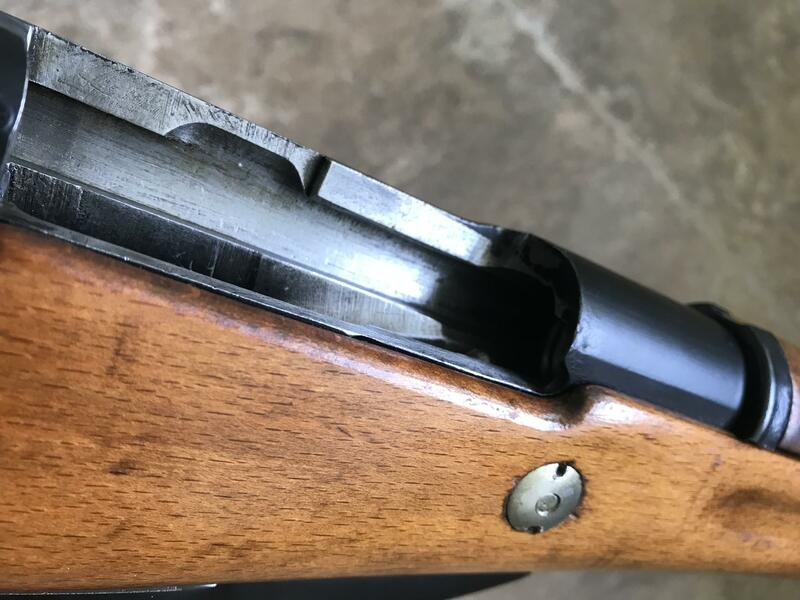 I can see how someone would want a super clean rifle, but do not condone altering them like that, and certainly not at the price they were asking for. I don't think there is enough interest in French rifles for someone to go through the trouble of doing that. If that was the case, it definitely was a one time thing done by whoever was the previous owner. However, even though there are some skilled gunsmiths and maybe even bubbas out there, my rifle looks too uniform and consistent to have been done in somebody's garage. I will get a pic of the right side of the stock when the sun is out again tomorrow. If it was done by someone after it got here, then they covered up the import mark because I do not see any. Thanks for the comments. The original stowed paint finish (Parkolac) may have been enhanced by a coat of varnish (the wood furniture looks varnished on the pictures). The original finish of the furniture was linseed oil. The receiver was provided by MAT arsenal (Tulle) but the rifle was assembled by MAC (Châtellerault) and the Serial number is from MAC, it was still in French military service in the late 1930s since it is showing the modification of the handguard (window cut to show the SN stamped on the barrel), and the "N" modification (rethroating of the chamber to use safely the Mle 1932N ammunition) both carried out in the 1935/39 period. Excellent thanks for the information Kelt. So that is pristine Parkolac paint and has 35-39 modifications on an original specimen. So CG Steve is a winner. Now CGSteve is it possible to take some macro views of the paint on the barrel, receiver or where ever you think is best in different light sources inside & outside light so you can provide the best possible close up views of the paint on that fantastic rifle. We need the best photos that actually make the rifle show in the pictures as it does in real life. I think a lot of readers will learn from your post and Kelt's fine comments. I am interested in closeups of the paint and what it really looks like, Please, please... maybe straight on at an angle??? Man I wish I could actually see that rifle. Sounds too good to shoot. Also the stock cartouche to document this fine specimen. I have never seen one in such fine original condition. Please photo document it. 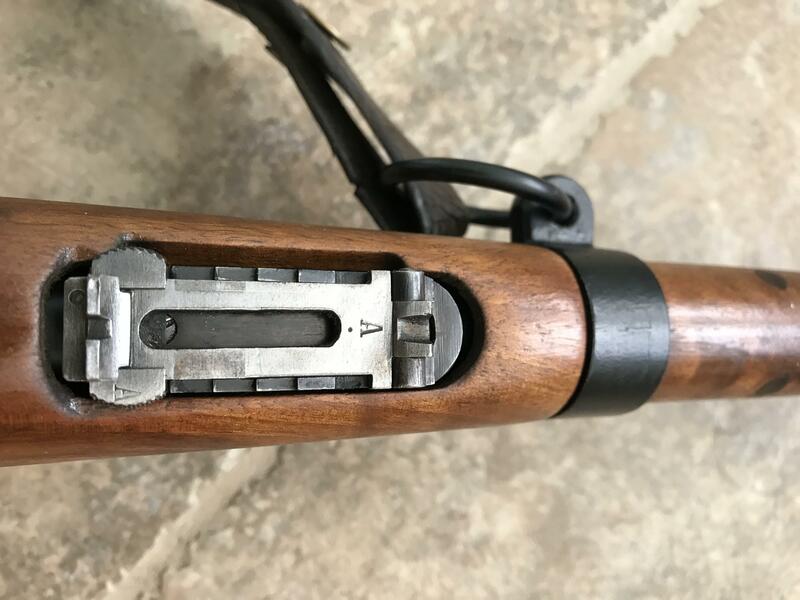 Are there any special stock stamps or receiver stamps indicating the modifications? I wish kelt would write a book in english about Berthiers. I am going to print out in color at the highest resolution your photos. Thanks for posting that rifle--- a real learning experience. British black paint is called "stove enamel" or Suncorite. It is enamel. It is a baked on high temperature finish found on some Enfields and Webleys. I can not find a description of Partkolac paint and if both are generally the same paint with different names. It does not come up under a search. Apparently in the above link, the french paint is an enamel paint called Parkolac or Parcolac. Here is the most macro I can get given that I do not even have an amateur photography setup. I can see the texture of the paint, I hope you can too. The best comparison I can make is if you own an Egyptian AKM. It looks like that except evenly coated, more carefully applied, and lighter sheen. The stock doesn't have any discernible markings/cartouches on it. You can see a very faint circle in this pic but if there was any icon or symbol it has long faded. Thank you both for the comments and the appreciation. Though I am not a Francophile I am glad I have an original rifle. Thanks, that is great pic of the receiver. 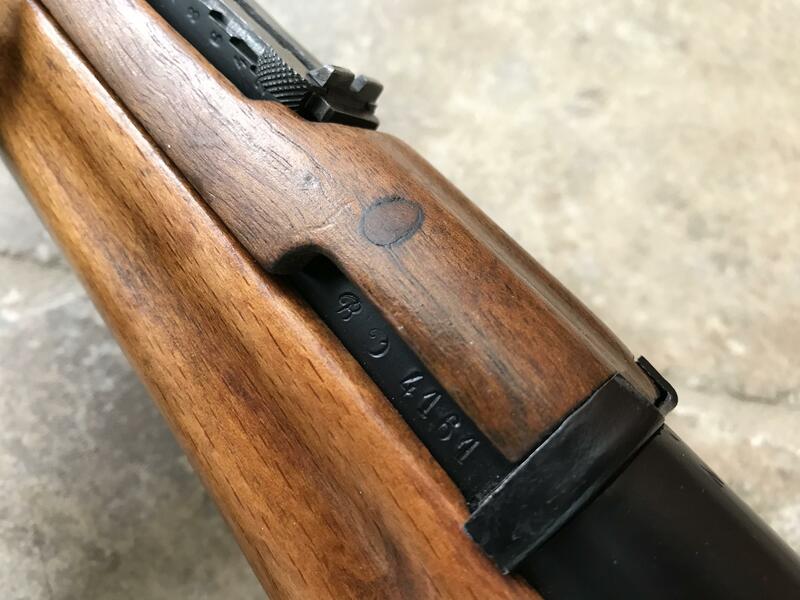 Too bad about the missing or erased circular reception stamp, the SN stamping on the left cheek of the stock is very crisp, the circular reception stamp was stamped just as vigorously and may have been erased on purpose. Thanks kelt. Do you know what the reception stamp would have looked like based on the facotry? Do you have a saved image from somewhere? 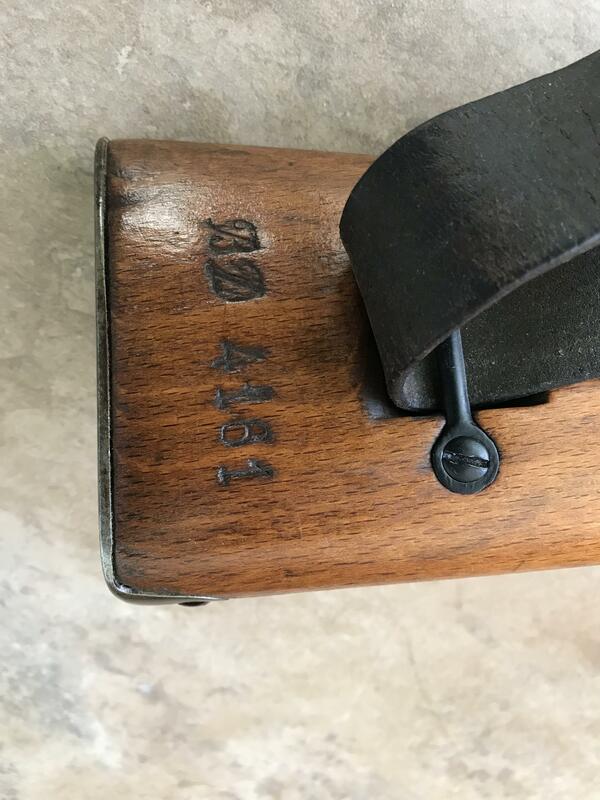 A few pictures of a Mousqueton M16 issued in September 1918 by MAC, the finish is very similar to CGSteve rifle.